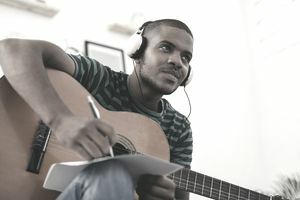 When it comes to your music project, chances are you have the idea, but you may be a little light on the cash to carry it out. That's where music business funding comes in. The process of obtaining funding from arts organizations is highly competitive and there's rarely enough money to go around. Don't expect to rely on loans and grants from arts groups as your project's sole or primary source of funding. And, keep in mind that depending on geography and other demographics, no everyone has access to this sort of music industry funding. But if you do have access, loans and grants from arts organizations are worth seeking out as supplemental sources of income. Here are a few tips to get your application as ready as possible. This may sound obvious, but clearly identifying your goals will help you decide where to apply for funding, and will help keep you focused when going through the application process. Most funders will want a very specific project, so rather than looking for "help funding my band" you're better looking for something specific like "funding the recording of an album" or "funding to publicize a tour." This is useful because getting something written down is a good way to help you work out exactly what you're looking for funding for, and if you can't write it in fewer than 50 words, it may be too vague. Funders will want a brief description to help them get an idea of the project before they read the full application form, and to use in any publicity materials. The summary should explain what the project is, why the funder will fund it and what makes your project unique. Make sure you know exactly what the application process is for each organization and what the deadlines are. Most organizations will require you to fill out an application form. Read through the application form several times and make sure you understand exactly what they want for each part of the application. If you have any doubts or questions, contact them and ask. Up to 10 percent of applications are rejected because the applicant hasn't followed the correct application process. Most applications will require a detailed description of your project, including a specific budget. This description should explain what you are trying to achieve and why they should provide you funding to do it. Make sure this is detailed, but don't go into any more detail than they've asked for. If they ask for one page, make sure you stick within that limit. The music business funders will likely be reviewing hundreds of applications, so don't overwhelm them with more information than they've requested. Draw up a timeline for when certain aspects of the project will be completed. It's important to remember that most funds will only fund "new" projects - that means projects that haven't started by the time the application process has finished. Make sure you're timeline fits in with the funders' criteria and is realistic, as it might form part of a legally binding agreement. When you've filled in your application, check the whole form through and ask someone to proofread it for you, before giving it one final read yourself. Almost all funders are oversubscribed, but no matter how worthy of funding your project is if you haven't supplied all the details they've asked for, your application may be rejected. When you send an application, send it at least a few days before the deadline to ensure it arrives in time. If possible, deliver the application in person. If sending it by mail, ideally send it by courier or by guaranteed delivery. Most organizations won't return submitted material, so don't send original documents. Most organizations will confirm they've received your application. If you haven't heard from the funder, there's no harm in checking in with them to confirm receipt, but don't pester them. It may be weeks or even months before a decision is made. In the meantime, make plans to continue with the project if the funding doesn't come through. Congratulations on receiving funding. At this point, most funders will ask you to sign a formal contract stating what they will pay you, and when, and what they expect from you. If you think your project may change, make sure you keep the funders informed. Most funders will disburse monies when certain milestones are met, but some may not pay you until the project is completed, so be clear on the terms. Even if your project met all the criteria, it may not be funded. You should have a backup plan in case funding doesn't come through. Contact the organization and find out why your application failed, and if you can re-apply. Don't harass them, however. They'll have lots of failed applicants, so their time is limited.